Venus Triplett, Olathe North: Triplett carried the ball 35 times for 200 yards and two touchdowns in Olathe North's double-overtime victory against Olathe South. He now leads the league in rushing yards with 496 on 97 carries, and he's scored seven touchdowns. At his current pace, Triplett will be at roughly 300 carries by the end of the regular season. We've never seen anyone close to that before. Talk about a workhorse. 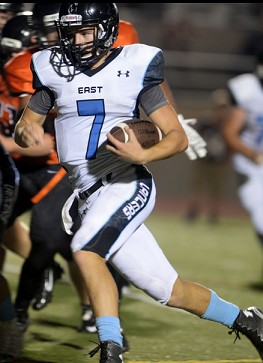 Gunnar Englund, SM East: In his third start of the season, and seventh start all-time, Englund completed seven of his 14 passes for 165 yards and two touchdowns. 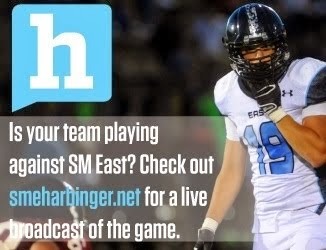 He also added eight carries for 48 yards and a touchdown, helping lead SM East to a 41-6 victory against SM Northwest. With a career record of 6-1 as a starter, and a quarterback rating which sits comfortably atop the Sunflower League, it's safe to say Englund has a case for being the league's top quarterback. If he can continue with his current production the Lancers are going to be very difficult to stop. Jeff Meyers, Olathe East: The Mayor and his coaching staff had a quite a bit to overcome leading up to last Friday. The James McGinnis injury, combined with the blowout loss to rival Olathe South could have resulted in a poor showing and another loss. But Meyers kept his team focused and ready to play, and the result was a 14-6 victory. The Hawks now stand at 2-1, and have a good shot at picking up a few more wins before districts kick off. *Olathe North did not submit defensive statistics. Lawrence, Free State and Olathe South did not submit complete defensive statistics. Eli, Thanks for listing the QB ratings. I think that you can make a case for Triplett to be player of the week. However lets take a look at the defense who played a great OS team. OS had a total of 70 points while only giving up 19 in the first two games. The first game alone they had 2 players rush for well over 100 yards(per KC Prep stats). In the ON game the defense made OS turn the ball over at least 3 times with a fumble recovery from Marcel Williams and 2 INTs from Burges I believe. Those were huge momentum shifts that allowed them to stay in the game in which could had been 20-0 at the half. The defense is what allowed ON to win the game shutting OS out for 3 quarters and the reason why they should be the player(s) of the week. Kenny - Olathe South is not a "GREAT" team. So are you saying that ON is not a "GREAT" team as well? And what are you basing them not being a "GREAT" team on exactly? What I based that on is the stats going into that game. And more so noone is giving the defense much credit. I am just looking at them play and there not a great team (I am not saying there bad or that they won't beat North in the playoffs). I have watched years of SFL football and there are not 4-5 great teams each year Maybe 1 and at the most 2 but not very often. This North team is FAR from great. Thats what im wanting to know what would make a team great? It's defenses who win championships rite? However I never said there is 4-5 great teams. Once again just basing it from the stats that was presented. I as well have watched SFL for many many years to know that you're not giving this defense enough credit. Is it their fault the offense wants to run the ball on every down and making it to where they have to turn around and go rite back out? No and they still do what they have to in order to help the offense get the ball back. Didn't North running back run for 200 yards against this great D. The best teams I have watched in recent years was last years SME team the last 6 games. North in 2009 was pretty good and they don't even compare to the 2004 ON team (but at least the 2009 team won a title). Stats don't show a great team 3 weeks into the season. I didn't watch the ON/OS game last week and think man how are we ever going to score on this D.
Statistically speaking (if we want to go into the dominance category) the three most statistically dominant SFL teams of the last 10 years (considering both offense and defense) were Olathe North in 2004, SM West in 2006 and Olathe North in 2009. This is based on points scored, points allowed, opponent strength, subjective talent evaluation, etc. As far as the eye-test goes, I'm yet to see a team as complete as Olathe North's 2004 club. It's almost a disservice to everyone who's every played in the SFL they failed to win the title that year against Salina South. Back to the main point: Olathe North is not setting any historical numbers this year, and SM East hasn't played the competition (nor will they all regular season) to put them in the upper-echelon, although they have been as statistically dominant as the aforementioned teams. If the Lancers can continue that dominance the rest of the way, and through the playoffs, then they will validate everything. But that's a big if. If stats don't show anything then why is their "power rankings" besides it's crazy to base this team off a team way back to 2003. I never said they were setting historical points I'm saying you're not giving the defense enough credit. But I guess if they win state then maybe they will finally get the credit they deserve but then again that might be a big if too rite? Wonder if there will be D stats posted for ON vs SME? I will checking everyday just to see if Weir or the staff will finally put there boys out there too contend with the other teams. There's a lot of talent on that team and I want to see D stats right along with O stats!! I challenge Weir and his coaching stats.....put the D stats out there.